An acquaintance visiting New York for the weekend just asked me if she should take a cab from Penn Station to her hotel 3 blocks away because of her huge bag. How much stuff do people pack for the weekend? In most cases, if you’re hauling around so much gear for a weekend that a 3 block cab ride is even a consideration, you’re packing way too much. Unless you’re carrying ski clothing/gear or here for Fall Fashion Week, you should be able to work with my very generous packing list. The goal for this list is to fit in airline allowable carry-on luggage. A legal carry-on sized roll-aboard suitcase, large daypack or a duffel bag. Plus a small personal item that would fit under the seat in front. If you’re driving, you have a lot more leeway. Everything on the list below is in addition to what you’re wearing in transit. 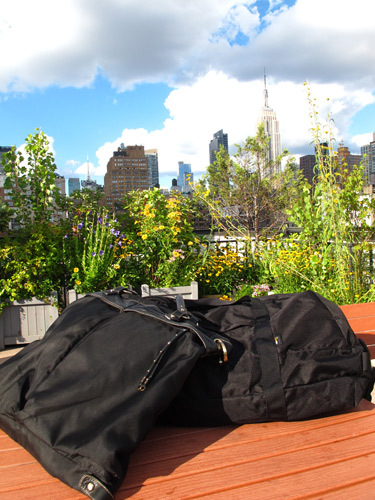 Two factors influence my hard roll-aboard or soft duffel bag decision. Am I going to a destination with liquids I would want to check if flying? Is the plane so small I will have to gate check the bag leaving home? For a trip to Belize, where I know I will want to bring home rum and hot sauce, I go with the hard sided bag. For a commuter flight to Toronto, where it was less likely that I would want to bring liquids home – and more likely the overheads would be too small for the rolling bag – I brought a soft sided duffel. Whatever bag I select, everything on the below list fits – with a lot of room to spare. 1 pair of shoes in addition to sturdier ones on feet in transit. Did I forget anything you just can’t live without?